In NSW, the assessment of how “clean” is defined in relation to a site, to incoming fill or to soil to be disposed of and is regulated by different sections of the NSW Department of Environment and Climate Change (DECC). The different sections apply different guidelines and standards. The following discussion excludes the consideration of soil containing asbestos. According to Getex , sites are assessed against acceptance criteria for a range of possible contaminants. The criteria depend on the intended use of the site. To assess a site soil, samples are collected and analysed for a range of substances. The selection of the range of substances for which the soil is to be analysed should be based on the history of the site and therefore the possible contaminants. The number of sampling points required depends on the size of the site, with a minimum of five sampling points, each point characteristically sampled at several depths. In addition to the basic samples, there must be blind and split replicates, blanks and rinsate samples analysed. The 95% Upper Confidence Level (95% UCL) of the average for the basic samples must be compared with the acceptance criterion. That is, if the site passes, then there is a probability that the average concentrations of the contaminants are below the acceptance criteria. Therefore, as long as there are no significant hotspots, it is possible for some results to be above the criteria. Composited samples can be analysed for non volatiles, thus reducing the cost, but the acceptance criterion is reduced by dividing it by the number of composited subsamples. Where contamination may be present compositing is not recommended, but it may save money when used as a screening tool where contamination is unlikely. The criteria also contain requirements for odour and ascetic factors. At times, soil containing broken pieces of brick may be considered unsuitable. A typical programme of site assessment and possible cleanup includes the conduct of a site history investigation, sampling, and if contaminated, preparation of a ‘Remedial Action Plan (RAP)’, followed by remediation (usually consisting of excavating the contaminated soil and taking it to a disposal facility), and validation sampling and analysis. 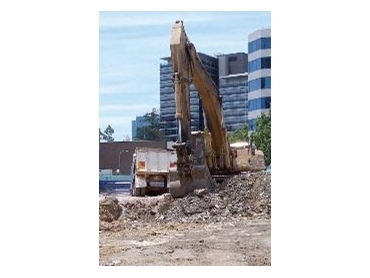 When soil is removed from a site and taken to a disposal facility, a Disposal Report is required as the facility is only licensed to accept certain classes of waste. The disposal report must classify the waste into classes such as virgin excavated natural material (VENM), special waste, liquid waste, hazardous waste, restricted solid waste, general solid (putrescibles) waste, general solid (non-putrescibles) waste in accordance with the Waste Classification Guidelines – Part 1: Classifying Waste DECC 2008. A series of resource recovery exemptions exist in addition to the waste classification guidelines. If the waste material is classified under one of the exemptions (the Excavated Natural Material Exemption), an alternative to disposing the material at a landfill facility may exist, which has financial and environmental benefits. For example, material classified as excavated natural material may be applied to the land as engineering fill or in earthworks. While some waste materials are ‘pre-classified’ such as building and demolition waste, others require a chemical assessment. The chemical assessment involves analysing samples of the material for potential contaminants, as well as leachability of those contaminants through the TCLP (Toxicity Characteristic Leaching Procedure) test. The TCLP involves dripping an acidic solution through a sample of the waste material for a period of time to determine the mobility of the potential contaminants. The leachate is analysed for contaminant concentration. The criteria for what is an acceptable level of contaminants on a site and the criteria for disposal of waste including contaminated soil are different from and independent of one another. Fill imported on to a site should be sampled and analysed against the site criteria. The guidelines require that the site which is the source of the fill be visited and assessed visually. Its site history should be examined and care should be taken to ensure that the fill arriving onto the site is the same as the material examined and sampled at the source site. Before accepting fill, Getex advice to check the material imported onto the sites has the appropriate documentation. The documentation should include sampling and analysis results. The sampling and analysis programme must be adequate for the volume of soil received and that the assessment must include an inspection of the source site and its history. The analysis certificate must be for the same material that is delivered. The material to be received on site has to be visually assessed and the analysis certificate must make a specific reference as to whether the material is free of any type of asbestos contamination. Care should be taken while moving untested soil around a site. If it later turns out to be contaminated, the contamination can be easily smeared around, resulting in increased clean up/remediation costs. On many construction sites, an Erosion and Sediment Control Plan (ESCP) or Soil and Water Management Plan (SWMP) may exist with sampling and analysis requirements that can range from simple ‘Total Dissolved Solids’ analysis required prior to the discharge of a sediment basin through to complex water quality assessments of existing waterways that may include a background assessment, assessment during construction and assessment post construction. Getex can review the Development Application, ESCP and SWMP requirements of the project and develop a sampling and analysis programme to meet the needs. Getex can manage the entire sampling and analysis programme, mitigating any conflict of interest that may arise by the site managers conducting their own sampling. In this scenario, one of Getex’s consultants will attend the site and conduct the required sampling. Alternatively, Getex can develop a sampling kit specific for the needs of the client and the ESCP or SWMP and courier kit directly to the site. Sampling kits include the required equipment, sampling containers, additional PPE (that is required in addition to standard construction site PPE), paperwork and step by step instructions that enable the client to conduct the sampling with ease. For sites that will be in operation over a long period of time, Getex can take over approximately five sampling events, and establish a site specific relationship between total suspended solids and turbidity.